Mack stared up at the tree, wondering how high he could climb. “I bet I can get all the way to the top,” he said, not bothering to look at his brothers, Reid and Brant. They were doing something else, but what could be more interesting than climbing a tree? He looked around at the others in the campground, but everyone seemed to be working on building a campfire or roasting something over the campfire. Why bother with roasting something when there’s a tree to climb? So much more interesting. “Don’t do it,” Giselle said, her eyes narrowing on her brother. Mack remembered. He’d been stuck up in the tree for hours, but he’d eventually gotten down. Climbing up was pretty easy and he’d just kept going higher and higher, exhilarated by the challenge and the views. It had just taken him a bit longer to figure out how to climb down. But now…now he considered himself an expert at trees now. 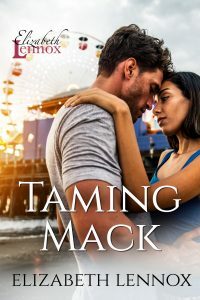 Mack watched her walk away, thinking that he might just have to tie her hair in knots again. Eh, maybe not. He’d done that already. It was more fun to torment her with something new. Then again, Giselle was getting older and smarter. With knowledge and experience came good ideas. Giselle was learning how to get back at her brothers in surprisingly evil ways. On the one hand, he respected that, he thought as he walked around the tree, trying to figure out the best way to get up into the branches. On the other hand, she was his baby sister had to be put in her place. No need to let her go around thinking she could make threats like that and get away with it. But there was the tree and climbing up into the branches was so much more interesting than getting back at Giselle. He glanced over at Reid and Brant, both of whom were whittling a piece of wood with their new knives. That was cool, too. But climbing a tree, seeing how high he could get…now that was an adventure! Reaching up, he grabbed onto the lowest branch with both hands. One more glance over at his brothers and he pulled himself up. When he was up on the first branch, he looked around. Giselle was sitting by the fire with their parents, roasting a marshmallow. Boring! Up he climbed, higher and higher. As he neared the top, the branches grew thinner and less stable, but he just kept climbing until he couldn’t get any higher. The branches up here almost mere twigs but…looking out, the view was incredible! He sat there for a long moment, enjoying the breeze and the views. Yeah, this is the life, he thought. He could live up here forever! Mack looked around, his foot slipping slightly on the next branch. But he remembered how difficult it had been the last time he’d climbed a tree, mostly because he’d broken the branches. Slowly, he climbed down, branch by branch, not breaking anything this time. When he was halfway down, his brothers realized that he was gone. Mack chuckled as he watched them look for him. He heard his sister snort as Reid and Brant called out for him. Unfortunately, the two oldest heard her sound and walked over to her. By then, Mack was mostly down from the tree and he grabbed onto the last branch, swinging his legs out, then dropping to the ground. Suddenly, Reid and Brant spun around. “Where’d you go?” Reid demanded, obviously more than slightly curious. “I was right here,” Mack replied, walking over to one of the chairs surrounding the fire. Giselle smiled and for the first time, he felt something other than irritation towards his baby sister. A kinship? Nah, that was going too far. But yeah, she’d kept his secret. Maybe she wasn’t as annoying as he’d thought. Eve stared at the tree and wondered what it would look like upside down. Trees were fine, but…they were just trees. Why not look at a tree in a different way. Eve watched as everyone else in her class hurried around, trying to find a special spot in which to draw their tree. As far as she was concerned, the tree just stood there. But…an upside down tree! Now that would be different, right? With that in mind, she walked over to one of the benches, not wanting to get her new jeans dirty. Her mother had just sewn the pretty rose appliques onto the back pockets and she liked them. Sitting in the grass like all of the others in her class would get dirt on her roses. Not what she wanted. So instead, she took her pencil and paper and happily started drawing from her perch on the bench where things were clean and there wasn’t the possibility of spiders climbing on her. Ick! With her mind’s eye, she looked at the top of the tree and started drawing, not really sure where her idea might go, but loving the possibilities. Perspective, her teacher had explained, was about making something look like it wasn’t flat. But it was also about looking at things in a different way. So the top of her tree was on the ground and she drew the leaves so that they looked like fingers holding the tree on the ground. She drew the trunk of the tree carefully, but maybe she was a bit more fanciful than the others. And since she wanted her tree to be more interesting, she drew a smiley face in the bark of the tree. The roots were in the air and Eve thought that the roots of the tree were a bit like toes. So she made her tree roots look like toes wiggling in the air, trying to enjoy the warmth of the sunshine. The class filed into the room and the teacher asked all of the students to sit in the front of the classroom where a soft carpet was spread out, just for this type of conversation. Eve looked around, nervous now. Everyone else had drawn just a normal tree. Some had big leaves, others had smaller ones. The bark was all boring. No one had drawn a face for the tree. Some of her classmates moved closer, several of them oohing and ahhing about her picture. “Is that a smiley face” one of her friends whispered. “Yeah,” Eve confirmed, whispering as well so the art teacher wouldn’t get mad. Someone else moved in closer and smiled. “I like the toes,” Janet said, grinning at Eve. Okay, so the teacher didn’t like her idea, but her friends did, Eve thought. That meant something, right? As the others in her class moved closer, trying to get a peek at her picture, Eve’s embarrassment over the art teacher’s harsh words eased up. Perspective, she thought. The teacher didn’t like her pictures, but her friends did. Wasn’t that what perspective was all about? And weren’t her friends more important than an unimaginative teacher anyway?